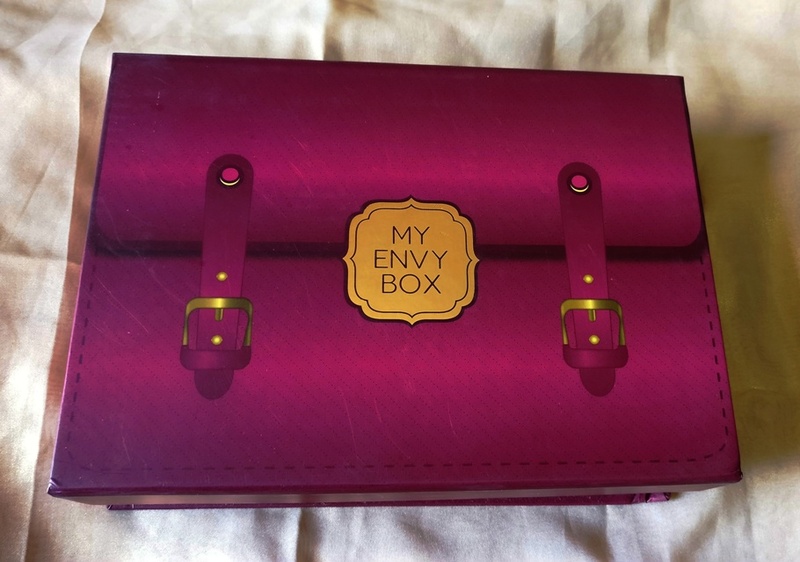 There are a bunch of beauty boxes in the Indian market but my favorite out of all of them is My Envy Box! As you may have noticed, I've been reviewing it on my blog over 3 years now and I really enjoy receiving a cute box filled with beauty, makeup and fragrance goodies every month! The April box is designed like a cute suitcase and came with a skincare, makeup and a body care product. The best part about this month's box is that 4 of out of the 5 products were full sized! 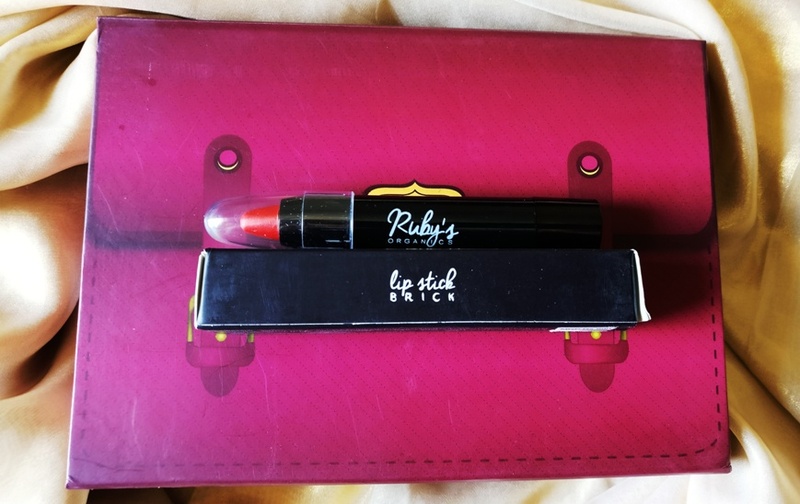 To start with the full sized products, there's Ruby’s Organics Lipstick (Rs. 990 for 3.7gm) which I got in shade Brick, which is a bright red. Ruby’s Organics is a new brand which uses natural and organic ingredients to formulate its products. This lipstick contains moisturizing Mango and Shea butter combined with Almond and Castor oils.This lipstick is creamy on lips but gives a soft matte finish on application. while giving the benefits of Mango & Shea Butter to help lips soften. It comes in a retractable pencil form and is easy to use and travel friendly. The other full sized color cosmetic in the box is Kinetics SolarGel Nail Polish (Rs. 475 for 15ml). I got shade Goldy which is made of sparkly gold glitter and little golden chips on a clear jelly-like base. It can be worn by itself and as a top coat. I've worn it both ways and it hasn't budged for about a week now so the product definitely lives up to its 10 day wear claim. 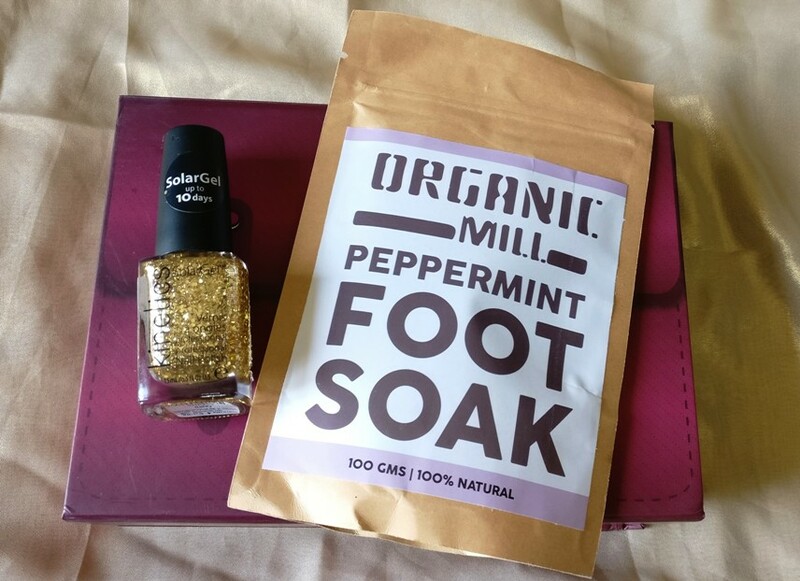 In body care, there's Organic Mill Peppermint Foot Soak (Rs 250 for 100gm) is made of sodium bicarbonate, citric acid, epsom salts and peppermint essential oil. This quickly cools and refreshes tired feet and is just perfect for summer. The full sized skincare product is Tvakh – 5% Vitamin C Glow Booster Exfoliating Water (Rs. 525 for 200ml) which is a leave on exfoliating water that fights mild to moderate acne, scars and uneven skin tone unveiling visibly glowing and radiant complexion. It contains Vitamin C, Tea Tree Oil and Glycolic Acid (derived from Sugarcane) that work to create a younger appearance with diminishing fine lines, reducing pore size and purifying the skin of residue and build up in the most gentle way possible. 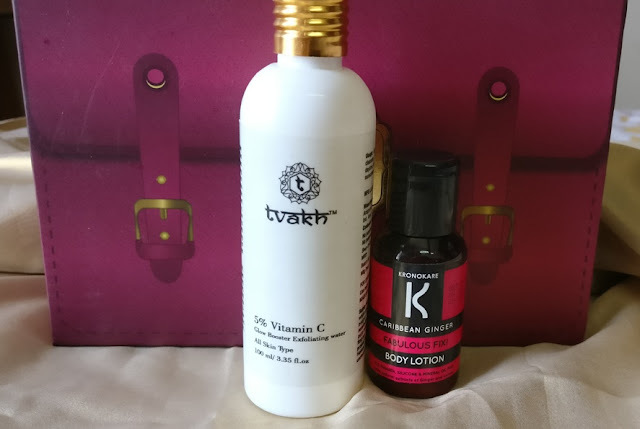 I use this on my face at night after cleansing and it leaves my skin feeling refreshed and tingly because of the vitamin C.
The only travel sized product is Kronkare Body Lotion (Rs. 1095 for 500ml) in Caribbean Ginger. This blend is enriched with plant extracts and pure ginger oil to promote skin fluid circulation and toxin removal for nourished and glowing skin. I really like the unusual fragrance of this product which reminds me of Galangal. Overall, the contents of this month's box were pretty good and priced at just Rs 850 per month, My Envy Box is a steal as you get products worth much more. I love it and absolutely recommend it to all my friends and followers! Looks like you got some fantastic goodies this month! Oh great beauty box darling!